4" New Construction GU10 Recessed Can Light IC and Airtight Rated This double wall recessed can light is for installation where the housing will be in direct contact with insulation. 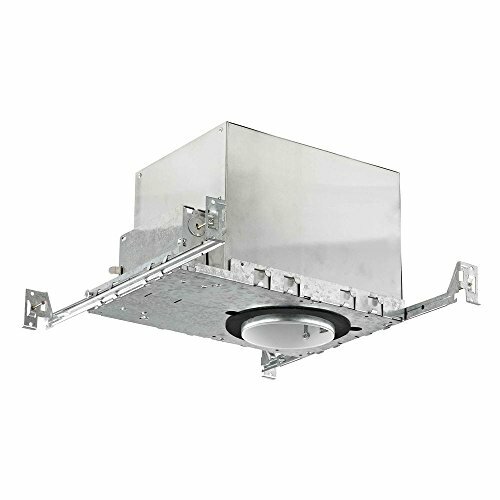 We recommend this housing to be used in ceilings up to 10 ft. in height. Great for applications such as kitchens, family rooms, hallways, living rooms, over seating areas and basements. This housing is ideal for use if you are looking for a small aperture recessed light. The GU10 MR-16 bulbs are 120-volts line voltage and do not require a transformer. Suitable for installation in dry and damp locations. UL / CUL certified. 7.75 in x 7.62 in. Recesso Lighting By Dolan Designs New Construction Gu10 Recessed Can Light Ic & Airtight Rated - Steel Ceiling Fixture - 7.75 in X 7.62 In.